It is part of my Lenten practice this year to mark the good news all along Jesus’ road to the cross. Perhaps you, like me, are living in a lean season and you need the good news more than ever. I know where this story ends and it is glorious; as hard as the road is, there is joy in the journey. This doesn’t diminish our need to take up our cross and follow Jesus. There is no cheap grace, but good news spills out on the way if you know where to look for it. So I think this is significant that Jesus’story begins with a baptism and an announcement from on high. There were no Lenten angels frightening shepherds, “Today in Judea I bring hard news of great suffering that will be for all people. . .” There was a voice from heaven, with words more wonderful than any such visitation. John was some months older than Jesus. I imagine when they were younger, he bested Jesus in every sport and physical contest. But the adult John had been made gaunt by his austere lifestyle: meals of locust and honey and long hours under the wilderness sun. In contrast Jesus was a carpenter—a laborer from Galilee with strong arms and back. The Nazarene would be the more opposing presence, even with John’s crazy eyes. Divine affirmation. The Spirit’s presence and the Father’s love. The good news for Jesus, even before he began his mission was that God (Daddy!) liked who he was. There was work to be done: Sin had to be dealt with, death destroyed, the Powers dethroned, but even before this, the Father sees the Son and his only word is love. You belong to me. I love you. I am so pleased with you. The tradition I grew up in practiced believer’s baptism. I have since served as pastor in the Evangelical Covenant Church, which practices both believers’ and infant baptism; however even before I called the ECC home I witnessed infant baptisms and sense how this too marked a sacred moment. I am a godparent to my niece and was there when her grandfather, an Episcopalian bishop, poured water from his cupped hand over her with that same Trinitarian formula, “I baptize you in the name of the Father, and the Son and the Holy Spirit.” I participated in the baptismal liturgy, listening as the congregation promised, and I promised as well, to nurture my niece in her Christian faith. At the conclusion, the church celebrated and welcomed her as a member of the family of God. A pastor friend of mine tells me he doesn’t like performing baptisms in church where no non-Christians are present. He says if baptism is an outward sign of an inward change, what difference does it make if unbelievers don’t get to witness it? What is the point? The whole Judean countryside came out to be baptized by John. Surely some must of saw John press Jesus’ head below the surface of the waters. I think the significance of all that transpired wasn’t widely known, but John knew it and so did Jesus. John saw Jesus, our good news, sealed by the Spirit and chosen by God. Jesus heard the voice of Divine Love–total acceptance, joy at who Jesus already was. John told others what he saw, Jesus did too (or else the Holy Spirit blabbed because we have it written down). Jesus is the chosen one of God come to set us free. God’s spirit rests on Him. Our lives are hid in him and the words that God once declared of Jesus can now be said of us: You belong to me, you are my beloved. I am so pleased with you. 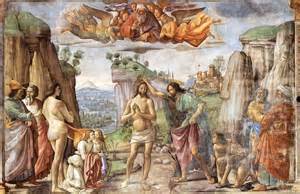 The story of Jesus’ Baptism is related in each of the four gospels (read it on BibleGateway.com : Matthew 3:13-17; Mark 1:9-11; Luke 3:21-22; John 1:32-34 ). Previous Previous post: The Sour-Faced Evangelists of Lent?